This badge was issued to Thomas Duerlund on 29 May 2017. 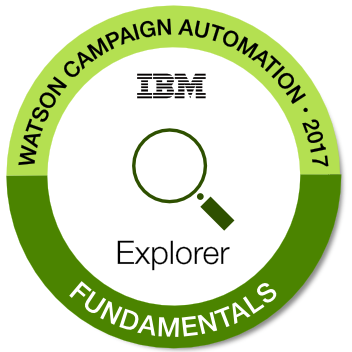 The Fundamentals Badge is the first level of the IBM Watson Campaign Automation Badge Program. It includes mastering the foundational features and functionality found in IBM Watson Campaign Automation/IBM Marketing Cloud. Badge earners have the knowledge and skills necessary to work with the important foundations features in IBM Watson Campaign Automation/IBM Marketing Cloud including: Databases, Queries, Contact Lists, Mailings, Reporting, Org Admin, Landing Pages and more. Must be an official IBM Marketing Cloud client, IBM Business Partner employee or IBM employee. This badge is now retired. Check the link below for other badge offerings from this badge issuer.